This entry was posted in BC Education, Disputes, Protests, Strikes & Labor, Unions, Working condition and tagged Protests, Strikes & Labor Disputes. Bookmark the permalink. I strongly oppose Bill 22because it infringes on the rights of educators. 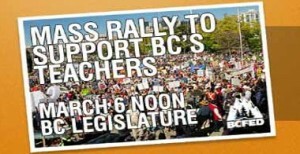 These people work incredibly hard to secure to educate B.C children and they’re rights should not be taken away. Teachers deserve to be paid adequately for they’re service.